Despite growing international concern, outbreaks of vaccine-preventable diseases are becoming increasingly common worldwide. In particular, an overall rise in measles incidence in multiple countries in addition to a number of high-profile outbreaks have generated considerable media coverage. Outbreak Observatory has discussed measles on several occasions, covering topics like its reemergence in the Americas and the cost of outbreak response, and since our last post, New York has faced a large measles outbreak. However, while press reports often focus on measles, it is important to remember that outbreaks of other vaccine-preventable diseases continue to occur in places where vaccine is widely available. To that end, this week’s Outbreak Thursday will discuss a recent outbreak in the United States (US) of another vaccine-preventable disease: chickenpox. Specifically, we look at the public health consequences of this outbreak and what public health officials can do to combat increased risks posed when populations choose not to vaccinate. Chickenpox is caused by the varicella zoster virus, a kind of herpesvirus. It presents initially with fever, malaise, fatigue, and a headache, followed by an itchy, full-body rash. The rash then turns into fluid-filled blisters, which then scab and fall off. The disease is spread through contact with the fluid inside the blisters as well as through coughing and sneezing. The varicella zoster vaccine has been publicly available in the United States since 1996. Since 2007, the US Advisory Committee on Immunization Practices (ACIP) has recommended that children and any other healthy individuals with no evidence of immunity to chickenpox receive 2 doses of vaccine. Routine childhood vaccination includes the first dose at age 12-15 months and the second dose at 4-6 years. Overall, vaccine coverage for varicella vaccine is high in the United States: the CDC reports that in 2017, the percentage of teens with no history of varicella disease who had received 2 or more doses of vaccine was 88.6%. But there are variations in coverage between states and within states, and pockets of low vaccination coverage increases the risk of outbreaks. Prior to the release of a varicella vaccine, chickenpox was a common childhood disease. Each year, it sickened a new cohort of children, such that by the time that individuals reached adulthood, most had been infected at some point or another and acquired immunity. While once a common childhood affliction, chickenpox was not necessarily the harmless rite of passage that many perceive it to be. Infected individuals were at risk for developing severe complications, such as infections of the blisters, pneumonia, and encephalitis. Prior to the availability of a vaccine, an estimated 11,000 Americans were hospitalized each year due to chickenpox. The US CDC reports that an average of 103 deaths due to chickenpox were reported each year between 1990 and 1996. Interestingly, most deaths occur in immunocompetent children and adults. Since the development of the vaccine, however, hospitalizations and deaths associated with chickenpox have fallen by more than 70% and 88%, respectively. Beyond the typical complications, chickenpox can produce other serious outcomes. For example, shingles, a disease caused by the reactivation of dormant varicella zoster virus. Shingles is a painful condition that can affect anyone who has had chickenpox, but immunosuppressed and elderly individuals are at the highest risk. In 2017, the US FDA approved a second vaccine for shingles, which is now the preferred vaccine for for use in individuals over 50 years of age. This is not the first time North Carolina has experienced a chickenpox outbreak. In 2006, an outbreak occurred in Yadkin County, just 2 hours from Buncombe County. The outbreak affected at least 50 children across 3 elementary schools and caused one death. North Carolina is not alone. From August 2015 to January 2014, 89 outbreaks of chickenpox were reported to the US CDC, with the majority of cases occurring among unvaccinated individuals. In 2017, the state of Minnesota reported 390 cases of chickenpox—the highest number of cases since 2013—most of which occurred in private or charter schools with lower vaccination rates. More recently, a primary school in Washington state saw 5 confirmed cases of chickenpox. In response, the local health department required any students without proof of immunization to stay home for 3 weeks. Though childhood vaccine coverage in the US remains high, significant outbreaks of vaccine-preventable diseases continue to occur, in part due to parents’ hesitancy or refusal to vaccinate their children. In understanding how to develop strategies to increase vaccine coverage, it is important to recognize that there is no one type of “anti-vaxxer.” Rather, the reasons why people do not vaccinate may vary considerably. Parents’ concerns about vaccine safety is often discussed as a contributing factor, but perceptions of low vaccine efficacy may be another reason why parents choose not to vaccinate their children. As one study points out, people may differ in how they perceive risks—eg, some may favor “natural risks” (disease) over perceived unnatural risks (vaccines). Access to vaccines and costs associated with vaccination have also been identified as important factors in vaccine coverage. Clinicians can also play an important role in parents’ decisions regarding vaccination. In one study, parents who changed their minds about either delaying or refusing a vaccination for their child listed "information or assurances from health care provider" as the main reason. In light of this, some researchers have begun to investigate strategies that best enable clinicians to encourage parents to vaccinate their children. Various approaches have been proposed, but studies have had mixed results with respect to the success of these approaches. Additional research is needed on this front to better equip clinicians to address the complex challenges surrounding vaccine hesitancy and reluctance among parents. Another important factor in whether or not parents vaccinate their children concerns state-based vaccine requirements for entry to public schools. While all states in the US have laws requiring students to be vaccinated as a condition of public school education, states vary with regard to the types of exemptions they permit for students. 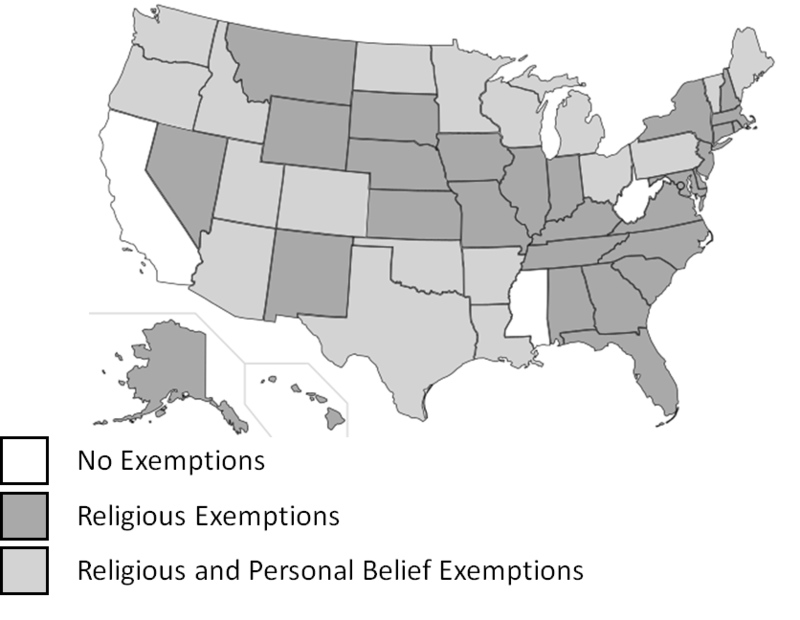 Only 3 states—California, Mississippi, and West Virginia—limit exemptions to medical only, while the vast majority allow for religious and/or personal belief exemptions. Research has shown that states’ allowance for non-medical exemption decreases vaccine coverage and increases the risk of outbreaks of vaccine-preventable diseases. In the case of chickenpox, varicella vaccine has been identified as the vaccine most common vaccine waived among children with non-medical exemptions. In states like California that have made it more difficult for parents to get exemptions, the number of non-medical exemptions have fallen. But in other states, the number of children with non-medical exemptions is increasing. Non-medical exemptions from state immunization requirements, 2017. Figure adapted from National Council of State Legislators (original data source: Immunization Action Coalition, Feb. 2017). In 2016, the American Academy of Pediatrics issued a position statement encouraging all states to eliminate non-medical exemptions to school vaccination requirements. In each of the chickenpox outbreaks discussed previously, cases occurred primarily among children with vaccine exemptions. In light of continued outbreaks of vaccine-preventable diseases and evidence of the contribution of state vaccine requirements to these outbreaks, states should heed this call to end non-medical exemptions. Chickenpox is one of many vaccine-preventable diseases which has seen a recent resurgence in the US. Although the prevalence of the disease has fallen dramatically since the introduction of the varicella vaccine, gaps in vaccination have allowed for dangerous and sometimes deadly outbreaks to crop up. To prevent future outbreaks, it is critical that the public health community identify the best ways to encourage vaccination and reduce vaccine refusal. Clinicians play an important role in encouraging parents to vaccinate their children, but continued research is required to identify the strategies that best enable them to fulfill this role. In addition, state policies that allow parents to circumvent school-based vaccination requirements should be reassessed in the context of evidence-based guidance that demonstrates the importance of limiting voluntary exemptions in bolstering vaccination coverage. Photo: Chickenpox patient exhibiting the characteristic rash; courtesy of CDC/John Noble, Jr., M.D.